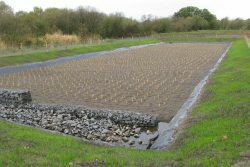 Relining project utilising Landflex EP100 composite membrane with protective Landflex G3000 geotextile underlayer. 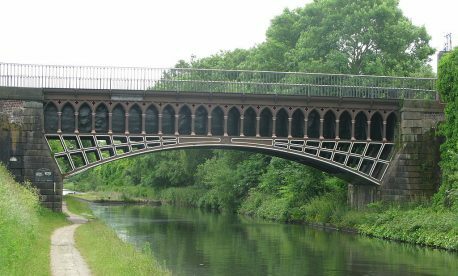 The Engine Arm Aquaduct was designed and constructed by Thomas Telford in 1825 to carry the Engine Arm Canal over the new Birmingham to Wolverhampton Main Line Canal. 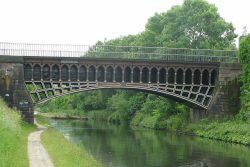 The Aquaduct is an iron trough supported on a cast iron laced arch with brick and stone abutments. The Aquaduct was previously restored in 1985 incorporating an EPDM liner and a new paint scheme. After nearly 30 years since the initial restoration works the EPDM liner failed and the aquaduct was leaking significantly from both abutments. 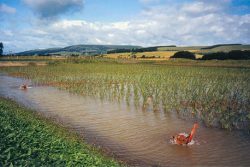 Butek Landline (part of the Butyl Products Group) were approached by RHD (on behalf of Kier Construction) to provide a suitable replacement lining solution that would meet the approval of Historic England (formerly English Heritage). 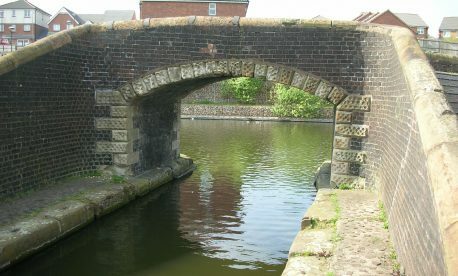 The Aquaduct is a listed structure with stringent restrictions relating to mechanical fixing imposed by Historic England. 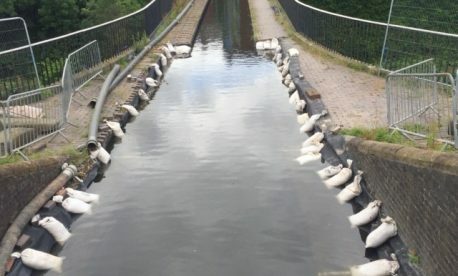 In consultation with the Canal & River Trust and other involved parties, Butek Landline devised a suite of solutions to fix the new Landflex EP100 liner to the aquaduct walls and canal approaches. 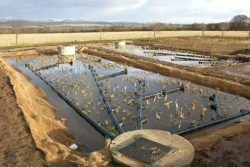 This included a combination of mechanical fixing (5.0mm thick s/steel battens with neoprene sponge backing and M10 X 60 s/s thrubolts) and a composite fleece backed waterproof liner in conjunction with specialist adhesives for porous and non-porous materials. To minimise welding operations on site the EP100 composite liners were pre-fabricated into large bespoke panels at Butek Landline’s state of the art factory in Billericay. The EP100 composite liner was installed by Butek Landline’s TWI trained technicians in just 5 days, including all vulcanised joint welding and fixings.